Senate hopeful Ned Lamont '76 speaks to reporters outside of Greenwich High School in Greenwich, Conn. today, before voting in the Democratic state primary. 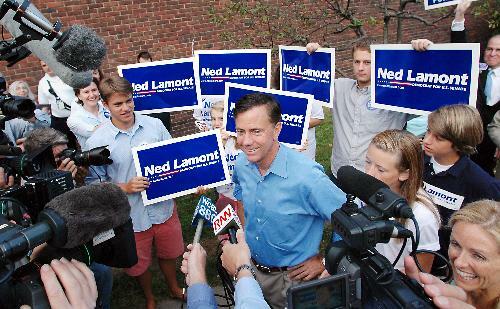 As he faces off against party veteran Joseph I. Lieberman in Connecticut’s Democratic primary election for the Senate today, Edward “Ned” M. Lamont, Jr. ’76 has continued assuring voters that he and conservatives can get along. Friends from Lamont’s college days at Harvard said that while he was outspokenly against the Vietnam War, he was still close with students with different political leanings than he had. Lamont’s opposition to the Iraq War has become a major campaign issue in the primary race; Lieberman has used strong language to stress his ability to work with Republicans. “That’s something that distinguishes me from my opponent in this race; I don’t hate Republicans,” Lieberman said, according to The New York Times. But Lamont, in an interview with The Crimson last week, cited his experience in business as reason enough to believe he can cooperate with individuals from both sides of the aisle. “I started out a business from scratch. I think I can work with people,” he said. As a student at Harvard, Lamont said that he was quite aware of his family’s extensive influence on the University. But his friends said that he did not seem self-conscious about his last name. Lamont was a fourth generation legacy student whose great-grandfather—Thomas W. Lamont, class of 1892—was a partner at J.P. Morgan and the donor who gave Lamont Library its name. “I’d think to myself, ‘How could he say that with a straight face?’” McPhillips said in recollection. Thomas W. Lamont became the youngest partner at J.P. Morgan in 1911, and was one of President Wilson’s negotiators in the Treaty of Versailles. Two-time candidate for Senate Corliss Lamont ’24, Ned’s great-uncle, was director of the ACLU for 22 years and fought censure by Senator Joseph McCarthy and mail censorship by the Central Intelligence Agency in court. Ned’s father, Edward M. Lamont, Sr. ’48, is an economist who helped administer the Marshall Plan and worked in Richard Nixon’s Department of Housing and Urban Development. Lamont told The Crimson that he remembers dinner table discussions between members of his family. Lamont's daughter, Emily H. Lamont '09, has donated $4,200 of her own savings to her father's campaign and has been helping on the campaign trail. "He's the least self-serving person I've ever met," she told The Crimson today. "There's too much ego in the Senate." At Harvard, the fourth generation legacy student lived with McPhillips in the same room that Tommy Lee Jones ’69 called home and that faced Al Gore ’69’s former room. McPhillips said that Lamont was a balanced roommate and friend who made close friendships with students of various socio-economic backgrounds. “He did not wear his money on his sleeve,” McPhillips said. Lamont’s campaigners are trumpeting the same theme in response to criticism from Lieberman about Lamont’s wealth keeping him disconnected from the average voter. The cable television entrepreneur released his tax returns last month after pressure from Lieberman, showing an adjusted gross income of more than $2.8 million for 2005. His advisers estimate that his total wealth is around $200 million, according to The Times, about 10 percent of which comes from his inheritance. Lamont—who was editor-in-chief of the Phillips Exeter Academy paper when he was a student there—said that he did not join any final clubs or major student groups at Harvard. The history and sociology concentrator campaigned as an undergraduate for Birch E. Bayh, a Democratic presidential candidate in 1976, and wrote his undergraduate thesis on Huey P. Long, Jr.­—the radical populist who served as governor and senator from Lousiana in the 1920s and 1930s. After graduation, Lamont worked for a small weekly paper in Ludlow, Vermont, eventually becoming an editor of the paper. Lamont, who acknowledged that his has not been a traditional route to politics, said that his passion for journalism eventually brought him to the cable television news business, where he made most of his fortune. —Staff writer Katherine M. Gray can be reached at kmgray@fas.harvard.edu.